Ever since I was a child, I have loved to spend a rainy afternoon with the box of family photographs; wrapping myself in memories of days out and birthdays and other events which might have merited being captured forever. Being a bit on the disorganised side our family photographs were often not marked with dates or any other information which added to the excitement of delving into the captured past. And as was the norm in the innocence of the 60’s and 70’s, our photos were held in an battered biscuit tin which lived in the dark recesses of an old, enormous side board in our dining room. As a young child, one particular photo in this biscuit tin always bothered me somewhat. Unlike our small, out of focus, family snaps, this offending photo was a shiny, large black and white image of my father being kissed by some very glamorous woman. The photo was taken at Dublin Airport where my father worked as a Customs and Excise officer. He was a handsome man and looked very dashing in his uniform. But who was this impostor woman kissing him? She was clearly not my mother. The photo always made me feel mildly uncomfortable. When I asked my mother, she said “Oh that’s Margaret O’Brien. She was some actress or something. 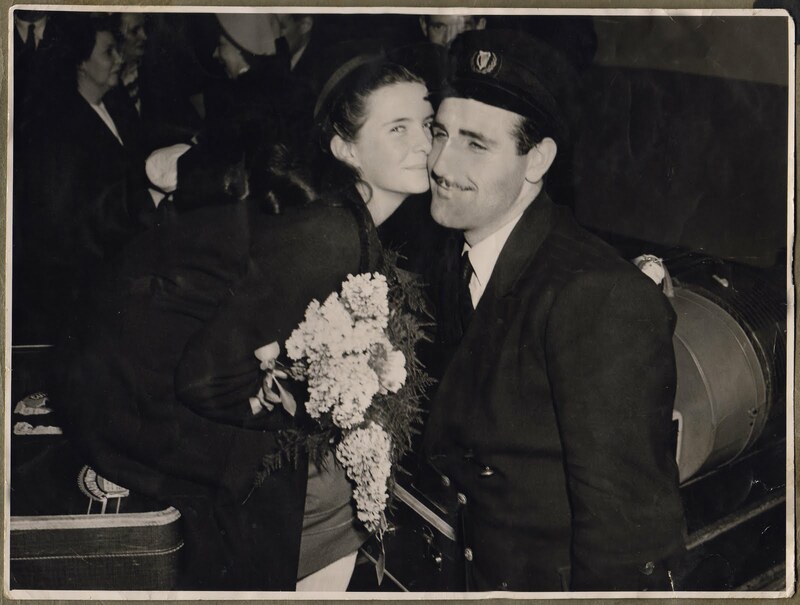 She arrived in Dublin and a press photographer asked your father to step in for a photo.” I still felt she had no business kissing my father, regardless of who asked her to. Although I must say that my father looked altogether delighted with himself. But as a child, I had a sneaking feeling that Ms O’Brien must have been a bit of a hussy and was not entirely happy about her image resting in our biscuit tin with the rest of the family. All of that was a long time ago and nowadays photos are held on hard drives and only those good enough for framing ever see the light of day in our homes. So the joy of rooting around in an old box full of family history is slowly dying out. Two weeks ago we were lucky enough to be on holiday in Los Angeles. We did all the usual sights of Hollywood including a tour of the Kodak Theatre which is home to the annual Oscar Ceremony. Although it only opened in 2002, it is a very beautiful building, full of art deco lines and subtle glamour. Our tour group was very small and our guide was a wonderfully knowledgeable and articulate woman called Barbara (aptly named of course). We stood on the stage and gazed out over the auditorium, dreaming of how it must feel on Oscar night. We were then taken on the same route that the stars are taken when they leave the stage with Oscar and head off to do their first press interview before returning to the theatre. Our journey took us down a long corridor which is hung on both sides with beautiful black and white images of various actors and actresses down through the years receiving their award. There was Clint Eastwood, Meryl Streep, Julia Roberts, Dustin Hoffman, Tatum O Neill. Suddenly I am stunned to find myself looking into the face of the impostor in our biscuit tin, Margaret O’Brien. “Oh my God, she kissed my father” I exclaim. My own children and indeed my husband are stunned. They have never heard the story or had a rummage in the old biscuit tin in my mother’s house. Barbara, our guide explained that Margaret O’Brien was a young actress who won an Oscar for her part as Tootie in the movie “Meet Me In Saint Louis” with Judy Garland in 1944. As I recounted the story for our little tour group, I could feel my father’s presence beside me, grinning from ear to ear just as he had in that old photo. And as the group moved on down the corridor, I took a last backward glance at Margaret O’Brien. “Good for you Dad” I thought. An Oscar winner no less! p.s. How handsome was my old Dad? I am now the proud keeper of our families biscuit tin of photos – Same one that used to be kept in our tall cupboard in our hallway, still stylishly covered in the woodgrain fablon applied in the 1960's. Great photo, your Dad looked like a film star too. Loved it!! so good!! I remember looking at that photo a while ago on the breakfast bar and my first thought was WOW grandad was a hottie.. didnt know where the photo was taken or who “your one” was? I thought about it for a bit and then got on with things.. Now i know, Lovely story mum!! Hey Barbara, you did Mike proud. I could just imagine how he would have reacted, sort of “so what!”, but he'd have been chuffed at your story. I wonder what happened to Margaret O'Brien. I don't think she made the transition to adult film star. I do remember seeing her in a movie, but she was very young. Anyway, well done! Great story Barbara, Mick certainly looks like the cat that got the cream! Thanks everyone for the great comments. I am glad you liked the story. And as Nor says I think Mick would secretly be very pleased too – not that he would let on mind you! Loved the story Barbara… and if you keep looking in the biscuit tin you might find a photo of another 'beautiful woman with goddess good looks' … your mother Nor! She really takes the biscuit! Thanks Jan and yep there are lots of photos of Nor and I am sure that she will be the subject of a blog post one day… but not being to libel the dead it is easier to write about Mike… and the Universe presented me with the story. We shall have to wait to see what shall be presented to me about the mother!!! And then I will have to get her to sign the release forms!!!!!!! And get her approval!!! !